Simply Red Biography, Discography, Music News on 100 XR - The Net's #1 Rock Station!!! 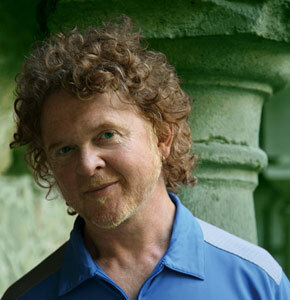 Born on June 8, 1960, in Manchester, ENGLAND, Michael James Hucknall formed this Soul-Pop band in late 1984; Simply Red came from Hucknall's mop of red locks and his attachment to Manchester United and the Labour Party; the first incarnation of the band included Mick Hucknall on vocals, guitarist Sylvan Richardson, bassist Tony Bowers, keyboardist Fritz McIntyre, trumpeter+keyboardist Tim Kellett and drummer Chris Joyce. The group's first single, "Money's Too Tight (To Mention)", was a worldwide smash cracking the top 30 on both sides of the Atlantic; the subsequent debut album, "Picture Book", released in autumn 1985, peaked at #2 in the U.K. and climbed into the top 20 of The Billboard 200 chart; the second single, "Come To My Aid", became a substantial club success and the mellow ballad "Holding Back The Years", rose to the top slot on The Billboard Hot 100, falling just one position short of #1 on the British Singles chart. 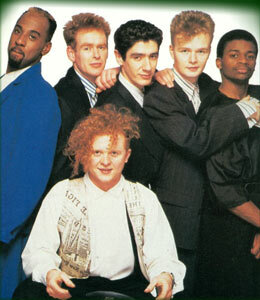 In March 1987 Simply Red, released their sophomore effort, "Men And Women", which reached the #31 position on The Billboard 200 list, backed by The Billboard Hot 100 top 30 hit "The Right Thing", this track was also a big success in the U.K. where it reached #11; the album included two more British top 40 singles: "Ev'ry Time We Say Goodbye" and "Infidelity". Following Sylvan Richardson departure, Brazilian guitarist Heitor T.P. joined the group in time for the recording sessions for the band's third album, "A New Flame"; the record, released in early 1989, hit #1 in Britain and soared to #22 in the United States highlighted by the cover of Harold Melvin & The Blue Notes' "If You Don't Know Me By Now" which shot to #1 on The Billboard Hot 100 and hit the top 3 in England; "A New Flame" generated two further U.K. top 20 hits in "It's Only Love" and in the album's title-cut. The line-up changes continued when Bowers and Joyce both departed to pursue other interests, they were replaced by bass player Shaun Ward and drummer Gota; in October 1991 Hucknall and his band released "Stars" which was a moderate success in America, reaching #76 on The Billboard 200 Albums chart, though the main single, "Something Got Me Started", rose to #22 on The Billboard Hot 100 and the title-track was a top 10 hit on the U.S. Adult Contemporary chart; they enjoyed greater commercial success in the U.K. where the album debuted at #1 on the Official Pop chart on the back of two top 10 hit singles: "For Your Babies" and the LP's title-track; "Stars", which yielded three more British top 40 hits: "Something Got Me Started", "Your Mirror" and "Thrill Me", went on to sell over 8 million copies throughout the world. After just one albeit successful album, Shaun and Gota left Simply Red; Hucknall and company returned with their fifth album in October 1995, "Life" was a relative commercial disappointment in the U.S. but it became a major success in Europe where it peaked at #1 on the Official U.K. Pop Albums chart and the lead single, "Fairground", went straight to #1 with sales of over 200,000 in its first week; the LP also contained the top 30 hits "We're In This Together", "Never Never Love" and "Remembering The First Time". Simply Red's "Greatest Hits" was released just a year later, the set made a mid-chart appearance on Billboard Magazine's Top 200 chart and shot to #1 in Britain, where the newly-recorded cover of Aretha Franklin's "Angel" peaked at #4. In May 1998 the band delivered "Blue", another marginal chart entry in U.S. but another #1 album in the U.K. with two singles in the top 10: "Say You Love Me" and "The Air That I Breathe". Premiered by the dance-orinted single "Ain't That A Lot Of Love" which hit the top 3 of the American Hot Dance chart and #14 on the U.K. Pop Sales list, the group's seventh LP, "Love And The Russian Winter", arrived in the fall of 1999 going straight into the top 5 of the British Albums chart. Hucknall and his band continued to record into the 21st Century, releasing the greatest hits set "It's Only Love" in early 2001 before establishing their own label, simplyred.com, in time for 2003's "Home", it received some attention in the States for "Sunrise" a nice mid-tempo that sampled Daryl Hall & John Oates' "I Cant Go For That", the single hit #1 on the Billboard's Hot Dance Music/Club Play chart, peaked at #5 on the U.S. Adult Contemporary list and reached #7 on the U.K. Pop Singles chart; the album eventually climbed into the top 3 in Britain on the strength of further top 10 hit, "You Make Me Feel Brand New". As the second release on Simply Red's own label, 2005's "Simplified", finds the smooth soulsters reworking classics of their back catalog as well as introducing some new songs including the U.K. top 30 hit single "Perfect Love". Simply Red's next album, "Stay", followed in March 2007; the lead single was the melancholic ballad "So Not Over You".